Bedknobs and Broomsticks & Others Lot (Buena Vista, 1971). One Sheet (27" X 41") & Inserts (2) (14" X 36"). Animation. Starring Angela Lansbury, David Tomlinson, Roddy McDowall, Sam Jaffe, John Ericson, Cindy O'Callaghan, Roy Snart, and Ian Weighill. Directed by Robert Stevenson. A Walt Disney Production. Included in this lot are two folded inserts from The Ten Commandments (Paramount, R-1972), and The Three Lives of Thomasina (Buena Vista, 1964). 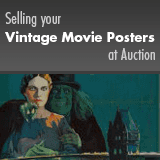 An unrestored poster and inserts with a clean overall appearance. They may have minor signs of use, such as slight edge and fold wear, minor fold separations, creases, small tears, and pinholes. Please see full-color, enlargeable image below for more details. Folded, Very Fine.